Dimensions 0.25 by 6.50 by 8 in. When Dragon finds a fat cat in the snow outside his house, he brings it inside and learns to take care of it, but he is soon in for a surprise when Cat has a litter of kittens. Original. Amazon.com description: Product Description: The endearing blue Dragon is back in bestselling author Dav Pilkey's humorous story about friendship and taking care of pets.Â When Dragon finds a stray cat, he brings it home and learns to take care of it through many silly mishaps. Then Dragon is in for a big surprise when Cat has a litter of kittens! 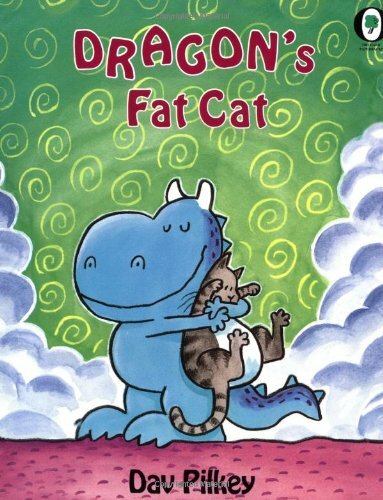 from Orchard Books (February 1, 2008); titled "Dragon's Fat Cat"
With Dav Pilkey | from Demco Media (September 1, 1995); titled "Dragon's Fat Cat"
With Dav Pilkey | Reprint edition from Paw Prints (October 15, 2008); titled "Dragon's Fat Cat"
With Dav Pilkey | Reprint edition from Turtleback Books (January 1, 2008); titled "Dragon's Fat Cat"
from Turtleback Books (October 1, 1999); titled "Dragon's Fat Cat"